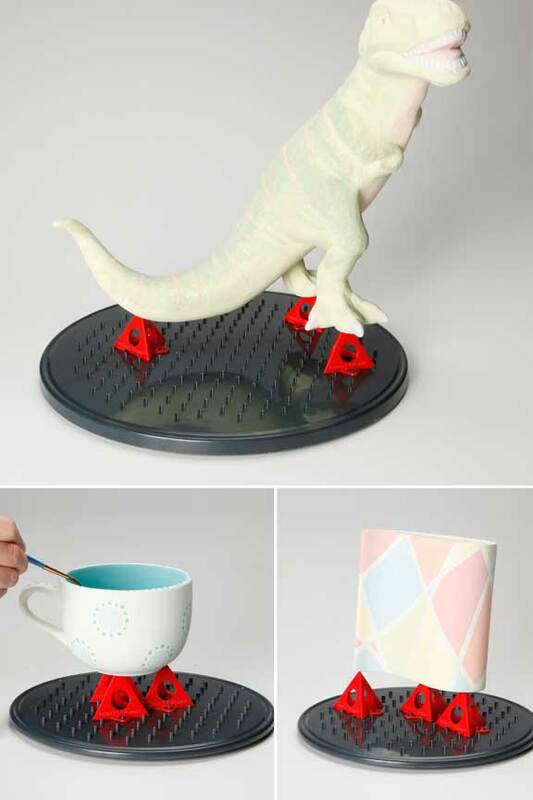 Stuff Points: Earn 21 points when you buy this stuff. Get better results, and spend less time waiting with the VersaSpin 360. It is an advanced turntable that will allow you to elevate the object you are working on, as well as rotate it to any position. It is available in your choice of sizes, and each one will come with two types of accessories to get you started. Depending upon size, you will get 4 or 8 grabbers and pyramids to use as the supports for the objects you place on this turntable. One will provide the lightest touch possible, while the other gives you a firm grip with more surface area. With this combination, you will be able to increase speed and quality at the same time, and instead of waiting days between stages, you will be able to power right through any project, so you can fix or producer more in the same amount of time. Ideal for craft projects and woodworking, but also great for painting, modeling with clay, decorating cakes, arranging flowers, gluing objects and so much more. Any task where you are working with a wet or delicate object can be simplified and made easy when you have this product. High quality components, and a quality design ensure that this advanced turntable will support plenty of weight, while still being able to spin freely. The smaller size holds up to 50 lbs, and you can support up to 200 lbs with the large one. You can certainly use it just like a regular turntable and it will work great, but the when you fully utilize the features offered, it will be far more useful. You will notice that the entire face of the table is covered in little pegs. These small protrusions will not make it difficult to rest things right on the turntable, but they are integral to the advanced nature of this device. The included grabbers and pyramids will secure to these pegs in order to add versatility and make any project easier to accomplish. With the size and shape of these accessories combined with the number and positioning of the many pegs, you will be able to set up any configuration necessary to accommodate any size or shape of object. Once in place, you will be able to lift your project up and keep it elevated, and you will also be able to spin it around to any side in order to work more easily. 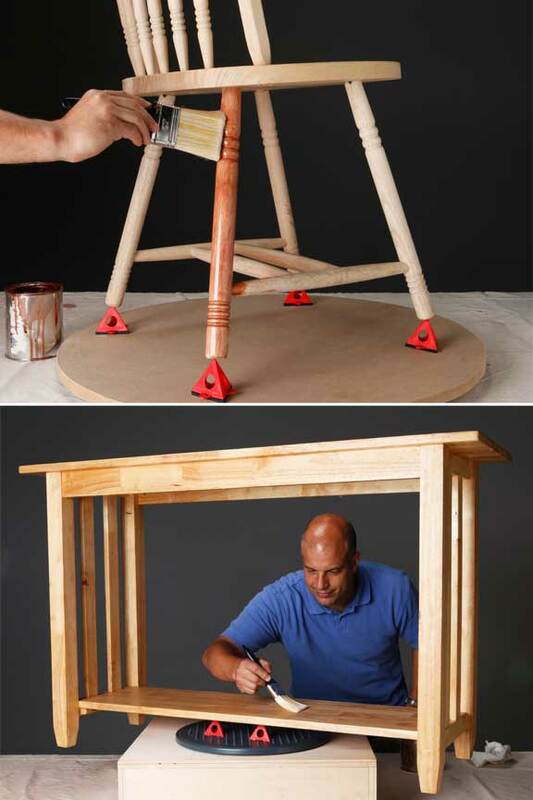 Paint the top, bottom and all sides without moving your body, or waiting for the paint to dry. To use it, simply place the type and number of supports where you need them, and then rest your item on top. It can now spin freely, and you will be able to access all sides. Depending upon the size VersaSpin you order, there will be 4 or 8 of these included in the package. Painter's Pyramids are sturdy little supports made from a strong polymer that does not allow paint, stain or glue to stick. They are pyramid shaped for strength, but also for function. They provide the smallest point of contact possible, yet keep objects in place and free of movement. The slightly rounded, non-stick point at the top ensures that only a minute portion of the object will ever touch the pyramid. Gently rest items on top in order to allow for working on all sides. 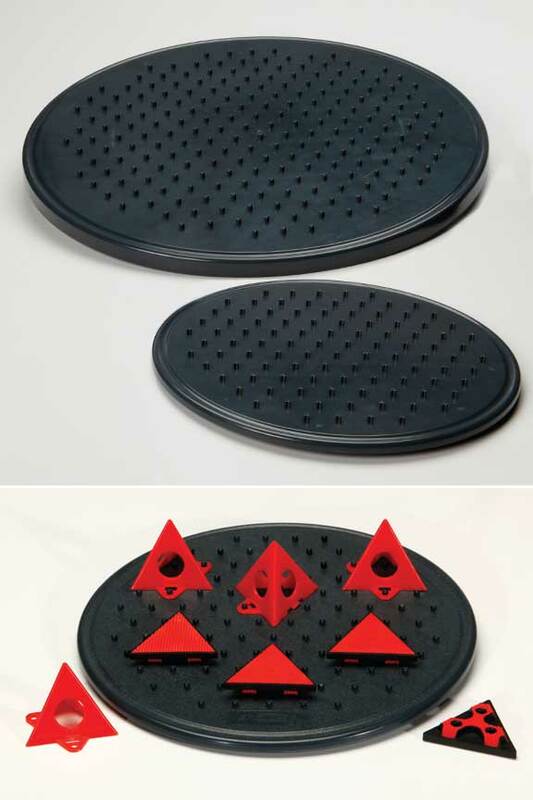 Each pyramid has little holes in the base that will connect with the pegs on the turntable so wherever you place them, they will stay without moving. Because the surface is non-stick and so small, you can rest freshly painted objects on top without worrying that you will ruin all of the work you just finished. These handy little triangles will also come included with your VersaSpin, and they offer benefits that the pyramids can't provide. Instead of a tiny, non-stick surface, you will have a much larger one that is high friction. When secured to the pegs of this turntable, they will provide a strong yet gentle grip on any object placed on top. The large rubbery surface will not ruin the finish on your object, or harm it in any way, but it will completely prevent movement of whatever is on top. Instead of providing a delicate balance point for wet objects to being painted, these accessories are more suited for facilitation of sanding, flower arranging, cake decorating, light machining and more. You can position them any way you want around the circle, and they will stay in place until you move them. Whatever you rest on top will be able to spin using the turn table, but it will not slip or slide in order to cause frustration. When your project stays put, it is way easier to finish and ensure that no mistakes are made. Choose the size that suits you best, but don't think that initial size will dictate the kind of object you can work with. This handy item is totally expandable and able to modify in order to suit your needs. You can secure a similar sized surface to the top for working with messier stuff like clay, or you can secure a much larger surface to the top in order to use it with bigger stuff. Mount a large circle using the pop out holes, and you can easily rest a dining chair on top or anything else. Weight will be the only limitation to the device, but as far as overall size, it can really expand to be useful with almost any item. For objects like shelves that can rest on the turntable alone, but that extend far out when doing so, try elevating the turntable so that the object can rotate freely while resting on the center point. The included accessories really make this device, and ensure that it is way more versatile than your run of the mill turntable. They are perfect for use on the spinning circle, but also highly useful on their own. When not in tandem with the VersaSpin, you can use them in much the same way for projects that don't require spinning. Instead of fitting them to the pegs on the surface of this spinner, you can use screws to mount them to any other work surface, and they can also be used without being mounted at all. Combine the two together, and the grabber can be at the bottom, and the pyramid at the top so that you have a high friction surface underneath to keep them in place, and a non-stick point at the top to rest your project on. Stop taking forever to finish projects, crafts and repairs. Don't settle for mistakes when trying to achieve speed. This handy turntable will make everything you work on easier to do. Instead of working in stages, you will be able to finish in a single sitting. Instead of waiting for paint to dry, you will be able to keep right on going. You don't have to have results that look homemade. This affordable tool will help you improve results to end up with professional level products. Regular turntables are great, but this one is far superior. Work with a flat surface, or use one with minimal touch points. Secure stuff that might move and even work with objects much larger than the overall diameter of the table. With so much versatility and functionality, it is hard not to find a reason to own one. Your cakes will look like they came from the bakery, your painting projects will look perfect, flower arrangements will be beautiful from all sides, and all of your other woodwork and crafts will be finished in less time while you achieve better results. Order Yours Today! Dimensions 11" x 2.5" or 16" x 2.75"
Uses Elevate objects and rotate them into any position to make painting, staining, and other projects easy. Weight Capacity 11" - up to 50 lbs., 16" - up to 200 lbs. Expandable Yes - easily expandable to accommodate large objects. Removable Accessories Yes - Use pyramids and grabber independent of the turntable. VersaSpin 360 - An advanced turntable to make all of your projects easier to complete. Ideal when working with wet paint, stains, glue clay and more. 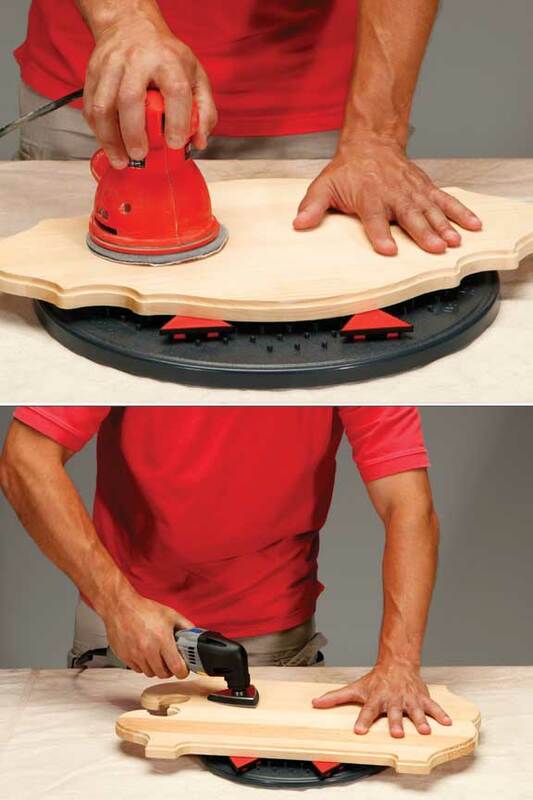 Elevate your project and spin it around without touching anything wet, or causing damage. Complete work faster, and achieve better results. Order Yours Today! Programmable. Turn lights & other devices on & off automatically. A Convenient, Squeeze Action Ratcheting Driver.